It’s that time of year where our NYE hangover clears and we take time to decide upon our goals/targets/resolutions for the year ahead. They say ‘don’t judge a book by its cover’ but we all do anyway. In a world of unlimited music, make sure yours stands out. Keep your branding (artist logo etc) consistent across all platforms, get proper press photos, get some good artwork for your releases designed. If you do not already have an artist website, it’s never been easier to make one with so many tools available online, check out this article for some tips on getting started. Take time on your brand, it’s important. Downloads are dead. Physical sales (apart from collectable vinyl) are still declining. Streaming is growing. Fast. This is one of the biggest shifts to ever happen in music, it’s changing everything from the way you plan releases to the way you connect with your fans and maybe even changing your recording processes. Learn everything you can about Spotify, Apple Music, Amazon Unlimited and Deezer. Know where your market it is and focus your time and effort on those platforms. Market for 2018 – Stop Wasting Your Money! 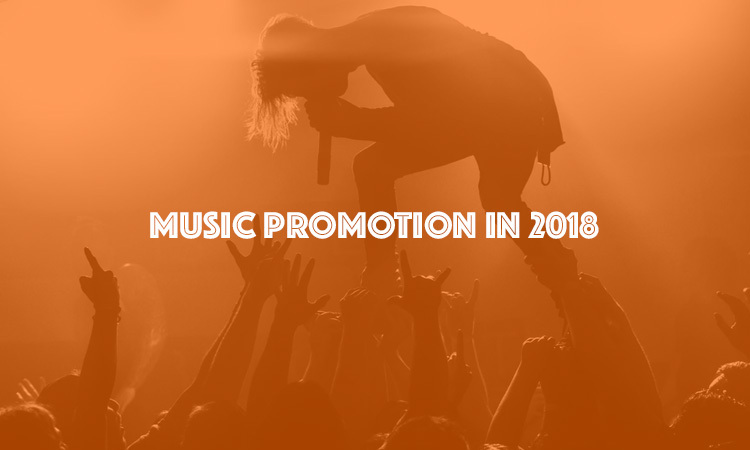 There are a million different ways you can market your music. Whatever your budget is, big or small use it to in a way that will reach fans. Make use of social media platforms and use tools like Buffer to plan and schedule your content. Submit music to Spotify playlists, you can submit music to hundreds of playlists for free on Soundplate.com or take it a step further and work with a PR company or a specialist playlist plugging company like Music Herd to get ahead in the streaming market. Attend industry events and conferences, you can find a list of music conferences here or just use Google/Facebook to find events in your area. Go to other artists shows, be seen in the right places and talk about your music! If you can’t get to many events, network on Facebook groups and music forums. The internet has made networking and music collaboration easier than ever. Work Harder, Spend More Time On Your Craft (but don’t be too precious) and focus on your fans. Working hard is obviously the key to success and the more time you can spend in the studio, writing or working on your music the better. Having said that, don’t fret too much over the little things. while it might pay off to be a perfectionist while you are in the studio, when creating web or social media content sometimes it’s best to just get stuff out there and see what works. Don’t be held back by your own ego or self-doubt. Get out there and make some great content! Whether you have 10 fans or 10 million focus on them.